I’ve just finished the bag of delicious gingerbread that Jakub’s aunt had sent me on my way with. A yummy sweet treat to enjoy in my tent each night. I don’t think I mentioned in my previous post that Jifi presented me with a 10th anniversary medal from his vintage club and I fitted it on the bike at Libor’s. So thanks Jifi. Tollways are a bit a nightmare especially when you’re not meant to be on them! At one toll in Poland I parked alongside a truck so as not to hold up the traffic while I tried to find some coins. This though meant the camera didn’t record me going through the toll. It then took ages to sort out with toll collectors what I had to pay given everything is automated. I confused everyone at another toll by being in the correct lane this time, but not working out that you have to take a ticket and pay at the exit. Within minutes I had a huge queue behind me, all patiently waiting. A security guy and the booth operator had to come and sort out the mess so everyone could continue on their merry way. I must admit I’ve held up the traffic for miles in many places simply because being on the freeways is often the only way I can know what direction I have to travel in. And there’s rarely any signs giving the minimum speed limit – which I can’t achieve anyway! So I apologise to maybe thousands of motorists who’ve missed their dental appointments, plane flights, court appearances & their wife’s birthday celebration because some old bugger was traveling at a snail’s pace on an antiquated piece of machinery just for the fun of it. I suspect the police in Germany won’t be quite as understanding as those I’ve met so far, those who’ve wiggled their finger at me and then asked if they could take a photo! I’ve never been a regular customer at McDonald’s until this journey started. Did you know that I can have a wash and a shave in a scrupulously clean bathroom, ask the smiling girl behind the counter to fill my water bottle and then rather than order a big Mac, she gives me a handful of paper napkins to clean the oil off my boots & wipe down Effie’s engine… and all for the price of an icecream cone? I should include them on my list of supporters do you think? It proved too hard to find somewhere to stop in Krakow so I deviated around the city and headed north to Kieice. Good weather for the most part, with pleasant scenery, but the chilly mornings meant putting on my thermals. I usually regretted this within a couple of hours as once the sun was up it was too hot for this kind of gear. Just wish the slots in my undies, the thermals & my trousers all lined up – I could have been arrested for tinkering with my toggle! It seems ironical to be experiencing problems when the roads are so much better these days, but I guess Effie is beginning to feel her age. For instance, we’d done 150 kms on one particular day though it had been hard to get over 20 km an hour. The back hub was now breaking up badly – every 30 kms or so I had to stop and tighten or replace the spokes. I’d refitted the pedal gear the day before when it broke, noting I must get the clamp bolt repaired asap. Next morning having started the bike, the pedal gear fell off again snapping the brake rod, so I stowed all the pedal gear in the pannier and rode to Przedbortz to get it repaired. So now I have no brakes and no footrest and am trying to negotiate town traffic while looking for a repair shop. Fortunately, I stumbled across Auto Centrum Swiech. Tomek the owner, rang an English interpreter Tukasz, (pronounced Lucas), who organized the welding of the brake rod and the repair of the clamp bolt. When I asked how much I owed, Tomek shook his head and presented me with 2 screwdrivers, a puncture kit, epoxy, cable ties, hose clamps, 2 bottles of mineral water, some stainless steel rod and a new reflective jacket because he thought mine was too dirty. What a guy! Lucas then took me home for a shower and breakfast. All this was just another example of the wonderful generosity of the Polish people. Lucas is an English teacher who also works for local newspaper. While he took photos of the bike his lovely mum made me a traditional Polish breakfast. His grandmother in her 90’s, had the strongest handshake of anyone I’d met on my journey! Camped that night 60 kms short of Opole after completing another 150 km ride, the motor has now developed a nasty noise. At just 100 kms from Kudowa border we’ve done 13,000 kms but it seemed we could go no further. I had an English speaking contact through Libor Marcik if I needed help, so it was now time to give him a call. Jan Kralik from the Transport Museum in Prague phoned Libor on my behalf, and he drove 300kms to meet me near Varrandov. It took me the whole day to crawl the next 90 kms to the meeting point we’d arranged. It was devastating to be so close to the end and now it looked as though Effie & I might not make it. A car passed towing a trailer and the guy driving gave me a wave. This had to be Libor – what a relief! At his home I dismantled most of the engine that day and discovered the centre main bearing had worn away. Libor knew the crankshaft grinding man who reground the centre main. He also knew someone who could make a new bronze bearing. All this was done in one day so that we got most of the engine reassembled the next morning. Wife Helena took me under her wing, feeding and caring for me like a long lost son. I’d lost 10kg so now looked even skinnier than usual. Local club members came around together with the media, one guy riding on a 1904 Torpedo and another in his beautiful black open tourer Ford and we all went to dinner together, fortunately with one or two people speaking English. On the weekend I went for a 40km ride to Bucek campground to meet Ardie & Josie from the Netherlands who both ride veteran bikes. They had very kindly brought along an original FN seat for me. What a difference this made to my now battered bum! Thank you Ardie for your generosity. Returning to Libor’s the two of us went on a social ride together visiting a castle, museums & a water hammer (a water wheel which drives a big hammer to forge steel). There were so many spokes broken by this stage that Libor decided the back hub needed to be fixed properly & I shouldn’t persist with my temporary repairs that had carried me all the way from India. 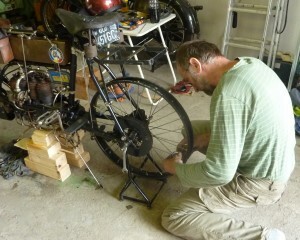 Back at his workshop we had the hub reconstructed by welding up the flanges and redrilling the spoke holes. He also organized a new set of spokes, driving 200 kms to pick them up so the wheel would be ready the next morning for refitting. Libor wouldn’t let me re-spoke the wheel and insisted on doing it himself & what great job he did, so much quicker at it than me. Having taken off the rear tyre to repair the wheel I decided to fit a new tyre and tube. This time thanks to the stronger Ensigns I had at least doubled the distance on the rear tyre with still some spare rubber to go, but it made sense to do it now. While Lynne was making her way back from an intensive English teaching course in Spain, I enjoyed a four hour walking tour of Prague. It’s a beautiful city with so many stunning buildings, castles, bridges and cobbled streets, but all heaving with tourists at this time of year. Now I’ve a short respite before crossing the border into Germany on my last leg of the journey. Effie’s in good spirits and I’ve drunk way too much beer at mealtimes & the local hooch to finish off. So I leave the Czech Republic having enjoyed many great experiences and new friendships. Congratulations to Jakub and Helen on the birth of their lovely new daughter and to Libor and Helena for their hospitality and incredible assistance – thanks to you all so much. Dekuji pekne. Hard to believe you’ve almost achieved your goal! Congrats, Ron, it’s such an achievement! You have amazing spirit and tenacity. Makes me wonder what is next on the agenda for you and Lynne. And what happens to the indefatigable, although somewhat worn, Effie now? Can’t wait for the update once you’ve “arrived”. Enjoy any celebrations that come your way – you deserve them! We haven’t quite got there yet, but not far to go. This weekend will be a great celebration of the FN marque amongst fellow enthusiasts. Riders arriving from everywhere I imagine. Still have to cross the border next week into Belgium to finish up at the FN factory as that was my ultimate goal. Do have something planned for next year…with Effie. Will take a few months out though to get myself sorted. Thanks for your support along the way. The countdown has(is) started, FN bikes are waiting!! Bernkastel –kues and many FN enthusiasts are ready to…. and me at least very happy to meet/see you. ? Yes, it’s hard to believe this week is finally here after our years of contact via email. Looking forward to meeting at last! Have a good trip from belgium. Thanks B. I think the end really will be in Belgium at the Herstal FN factory but this will be a nice way to celebrate the long journey. Thanks for cheering me on. Looks like it might be a wet day’s riding today, hopefully not to heavy. mein Name ist Dieter Denzer. I organize the FN – meeting in Bernkastel-Kues. The work is almost finished. The meeting point is signposted. I’m sure you also manages the last Km. Otherwise, call me. Then I’ll pick you up. A bed for you and a garage for Effy are ready. I’m having problems sending an email to your address. Can you please send me the details of the hotel in Bernkastel. Thanks. Looking forward to the weekend and meeting you all. I mailed you a few days ago about the meeting in Bernkastel but didn’t get a reply yet. I hope you got my message (sent via ‘Followers’? I’m sorry if I missed your post. Am emailing you offline re meeting up. Keep on going Ron,fingers crossed! Thanks Luc. I think we’ll be fine. See you in Bernkastel! I live in Bruchsal, I have 3 FN`s. If you like to stay overnight or if you need any help give me a kontakt. Otherwhile I´ll see you in Bernkastel – I´ll come on Saturday evening till Sunday. Am on my way to Bruschsal tomorrow (Monday). Will email you re. meeting up. I hear the drive is through the Black Forest is really nice. Looking forward to it. In a few days it will all be over – I imagine it will be a strange feeling after so many months on the road. I’ve definitely had some amazing experiences & life won’t seem quite the same. Thanks for your continued good wishes. It’s good to know so many friends are cheering Effie & I on. If you want to, you can store your bike in my(reasonably) well equiped workshop, and come and work when you feel like it- I can help you find the parts you need and people able to help . No stress ! See you in Bernkastell soon . I understand about the factory being high security these days. Just a photo opportunity outside would be fine by me, given their focus is no longer on bikes. I do appreciate all your efforts and offering your workshop. Will email you privately. Resting up today and will set off tomorrow for the final leg. I’m pretty excited about meeting you all in Bernkastel. To give you an idea about number of FN Motorcycle alive, in year 2002 for the centenary of the first Fn motorcycle, our club has organized in collaboration with the FN a big meeting with 270 FN motorcycles. 26 motorcycles 4 cylinder was there and Libor came with an M86. I hope test the moto with a run this Friday. Best wishes for the last Km. That’s amazing there were so many FNs at the centenary in 2002. I wish I’d had my bike going then and I’d have joined you! Hope your test run goes well & look forward very much to next weekend. As Pierre Laumont and Jacques wrote about me, it’s time for me to put some words on your blog. I read your blog from the beginning of Your Marvelous or “Crazy” adventure. I enjoy see you at Bernakstel and after in Belgium. I am 67 years old and as I ride sometimes on my 4 cylinder made in 1905, without clutch and only 360cc (only 1500km during 7 years) So, I know the difficulties to use such engine. Stop at crossway and restart engine, only one break, without gearbox and a twisting frame, it’s not easy to ride on big town or at the mountains. Sure, for you and for Effie it is an exploit and you may be proud to have done this journey, congratulation by advance. Effectively I am chairman of VMCB and I spend my entire work live at the FN Factory, (but after motorcycles production) and I do the maximum with Mister Sauvage to give you the possibility to enter at the factory. As this time I work on my effies and hope it’s should be in order to ride at Bernkastel. Be careful during Germany travel and enjoy see you next week. I’ve heard all about you from Jacques and Pierre and I appreciate what you have done in trying to gain me entry to the FN factory. Once the rally is over I will head to Herstal. I don’t want to push my luck riding for too much longer given Effie has exceeded my expectations of doing 12,000kms and is definitely not sounding at her best. As you say, stopping and starting and with very little brakes & no gears, it’s not everyone’s idea of a fun ride! I would very much like to see your 1905 model and hear about your experiences over the years at the factory. I’m amazed how many FNs are around today and being ridden, even occasionally. I hope you get to ride your bike to Bernkastel – it will be good to meet up Michel. Do write to my email address and I can give you more up to the minute progress plus my phone number. Ron, I like the way that you like route. I am glad my friends report that the old man on the FN parked at their petrol stations. The route you suggested was really great. A nice mix of gentle hills, nice scenery and bends. Funny to have someone hand me the phone and hear you on the other end! It’s a small world. How many other people do you have looking out for me? LOL I’m taking it real easy in the hope Effie can make it to the end – just a few more days. Thanks for your support. I really enjoyed the Czech Republic and made many friends along the way. Keep enjoying the ride. Thanks for all you and others have done towards arranging a visit to the FN factory. Sounds like it’s not something that happens very often. I’m currently at Ingolstad. Expect to be in Stuttgart on 7th/8th then will make my way up the Bertha Benz Memorial Route from Pforzheim to Mannheim on 10th, stopping to meet a friend at Bruschal. I expect to arrive in Bernkastel on 13th all going well even if I have to push Effie there! Looking forward to meeting at last my friend. dear ronnie and lynn well buddy you are nearly there and i think the fun is about to begin.it sounds as though belgium will be abit special what with all the local classic bike fans waiting to meet and greet you both.we are glad to hear about your rear rim etc being repaired that should make progress a bit easier.keep on trucking and keep eating . love and regards gary and di. I’m looking forward to that fun you mentioned! The rims are great now and Effie ran good for a day or two, but the motor is sorely in need of major work, so I’m coaxing her along day by day. I guessed she was good for 12,000kms and I wasn’t far wrong. Thanks Ngaere. I’m in Germany so not far to go now. I thought this part was going to be easy, but I’m having to coax the bike to the end. Fingers crossed! Glad you got the necessary help in Poland and that you are still going on. We should meet in Bernkastell Kues, and I know the Veteran Moto Club Belge would like to honour you when you come to Belgium. Among other thinks, some of us would like to accompany you to Herstal on (+/- !) age related belgian bikes. Robert Sauvage in charge of “Ars Mechanica” (an organisation devoted to the past glory of the FN factory) has been contacted to see if your bike would be allowed to pay a visit to the place where it was made so many years ago ? Any idea yet of the timing after Bernkastell Kues ? If you’re interrested keep me informed. I have had great pleasure reading of your journey from the beginning, having visited myself (but not on old bikes) many of the countries you went through. Safe riding trough Germany and enjoy !! We’re still going, though not strongly. The journey has definitely taken its toll on the bike. Fingers crossed we make the last 500kms. I had planned that after the rally I’d head to the Netherlands, then to Belgium, but that’s not looking such a good idea, given the state of motor. Instead I will ride directly to Herstal from Bernkastel as I am very keen to visit the factory if at all possible and having club members along also would be an honour for me. Glad you’ve been enjoying the blog and thanks for all the support Pierre.